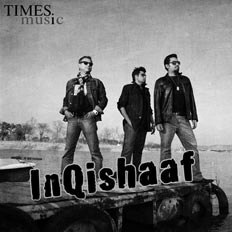 InQishaaf’s debut launch under the Times Music of India label, titled ‘Kissa’, defines what music means to the band; the recognition of music, talent, art and expression that traverses every caste, creed, age and perspective. With this philosophy in mind, InQishaaf has churned out a blend of immense realizations and emotions in this album. We would like to sum up our musical journey with the oft-used phrase, ‘Every success begins with a dream,’ and this is exactly what we did! This album converges at a cornerstone of emotions - the aggression for progress, the happiness in life, spirituality and so forth. Over the past few years, we’ve managed to carve a new niche in our music where it cannot be categorized by conventional genre. When they say that music knows no boundaries, it’s because it transcends its geographical inclinations to a kind of music that ‘sounds’ good because it ‘feels’ good. For our fans, we hope that with every track you listen to, a part of you becomes alive for just that moment, where you can ‘feel’ our music. This will be your InQishaaf.